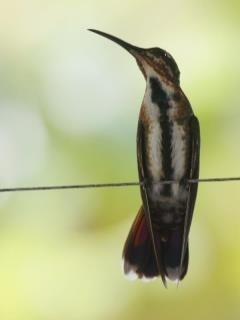 Kevin Easley and some other avid birders from Costa Rica visited the Western Azuero and Coiba with me. On 3 May we went to Changuale (East of las Flores) to try and find the Azuero parakeet. Wer did not find it, but saw many King Vultures circling above us while walking along the Pavo river. We left for Coiba on 4 May. Between Santa Catalina and Coiba we saw Red-necked Phalaropes, Brown Noddies, a juvenile Red-billed Tropicbird and a Parasitic Jaeger. On the Las Pozos trail on Coiba we found the Coiba Spinetail and the Brown-backed Dove. There was also a male Indigo Bunting in breeding plumage (The Angehr guide does not mention that Indigo Buntings occur on Coiba). Furthermore, for the last three weeks, our hummingbird feeders are daily visited by a juvenile mango. I have attached a (small) picture of the bird. I think it is a Veraguan Mango.